Leap's Note: Today's post comes from Undercover Tourist customer and super Disney World fan Vern Woodruff. Vern has written about the Bibbidi Bobbidi Boutique, princess dressing in the parks and the Jedi Training Academy. A highlight of a Walt Disney World vacation for many children is meeting the many Disney characters that are throughout the parks. 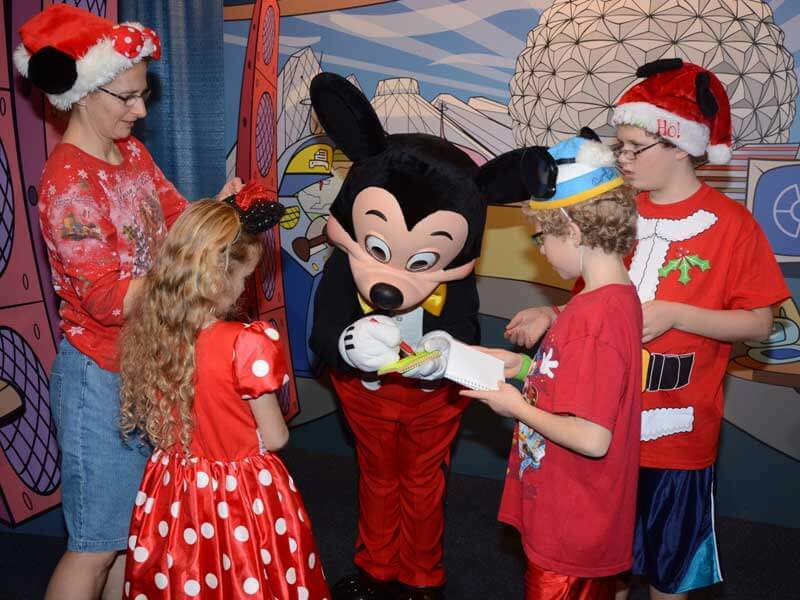 These character greetings can be the favorite part of a visit, topping even the major shows and attractions. On our last visit, meeting Anna and Elsa was the favorite activity of my 7-year-old daughter while meeting Donald Duck was second only to Toy Story Mania for my 9-year-old son. Prior to our first visit in 2012, I had underestimated my children’s interest in meeting the characters. I also did not account for the number of kids that had Disney autograph books and how that would create a strong desire in my own three children to obtain autographs. While my wife and I were able to rein in their autograph ambitions that trip, when planning our next visit I knew to account for many character visits and needed to determine how to best accommodate their want for autographs. There is a plethora of character meeting opportunities throughout the parks and Disney has a variety of autograph book options for kids to collect signatures. The simplest option has a Disney-themed cover and is filled with blank pages. A fancier option has a sleeve for holding a photo and a blank space next to it for an autograph. I considered these options, but decided against them. I didn’t choose the themed cover with blank pages because I figured, while the kids would be enthralled with the book and trying to get it filled at the parks, it would be quickly forgotten after returning home and would end up lost under their beds. The fancier option to have a photo with the autograph was appealing, but the capacity of the book did not seem large enough, and I did not want to run out of room for signatures. As a result, I came up with an option that would allow for as many autographs as the kids wanted, while allowing for the inclusion of photos and the ability to organize everything however the kids wanted. Here are the steps and details for what I did. 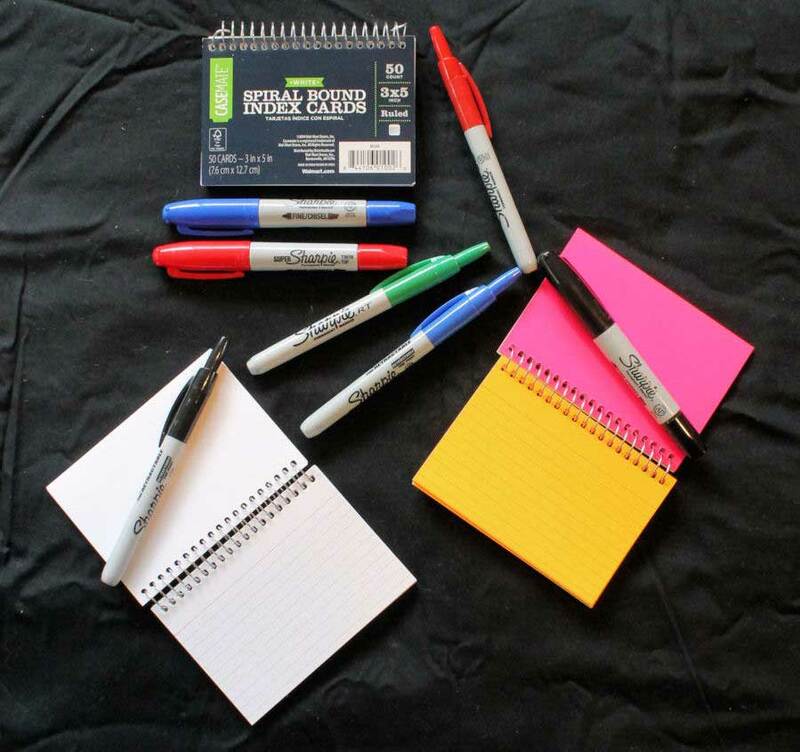 The two items you will need to take with you are a spiral bound booklet of 4x6 index cards and markers, both of which can be found in a store's office supply section. The booklet contained 50 of the 4x6 cards, which had micro-perforations at the top of each card to allow for clean removal from the booklet. With 50 cards, the booklets were easy to hold and sturdy enough for signing autographs. My boys picked plain white cards, while my daughter chose one that had several fluorescent colors. For markers, the kids wanted to have a variety of colors and I wanted markers that could easily be used by the face characters (such as the princesses) and the characters that were in a full costume. Since the face characters can use their bare hands, retractable markers that worked with a click were a great choice. The costumed characters, with their hands covered, can more easily grip and sign with a larger marker. I found a larger-bodied marker with a fine point that ended up working well for them. One note when selecting a marker like this, be sure to check the type of tip because a chisel tip will not work as well as a fine point. One additional item you may want is some type of bag for carrying your supplies and keeping them handy when in the parks. My wife had a backpack, so we kept everything in it. If you have not been to Disney before, you may be surprised at the number of character greeting opportunities and their popularity. 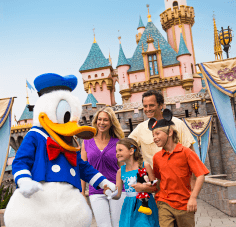 There are so many that you could spend an entire day only visiting characters, so make sure to plan visits with your child’s most popular characters first. The Times Guide you can pick up when entering the park will list many, but not all, of the character greetings and their times. If you are planning ahead, just prior to your trip you can check out each theme park’s daily schedule on the Disney website and find out what character greeting opportunities will likely be available when you visit. If you're in the park, you can use Undercover Tourist's free Orlando iphone app to see the times and locations. Once you are actually in line for a character, get the booklets and a marker out ready for use. If you have multiple kids, select just one marker to use. It is too difficult trying to use multiple markers during a greeting. 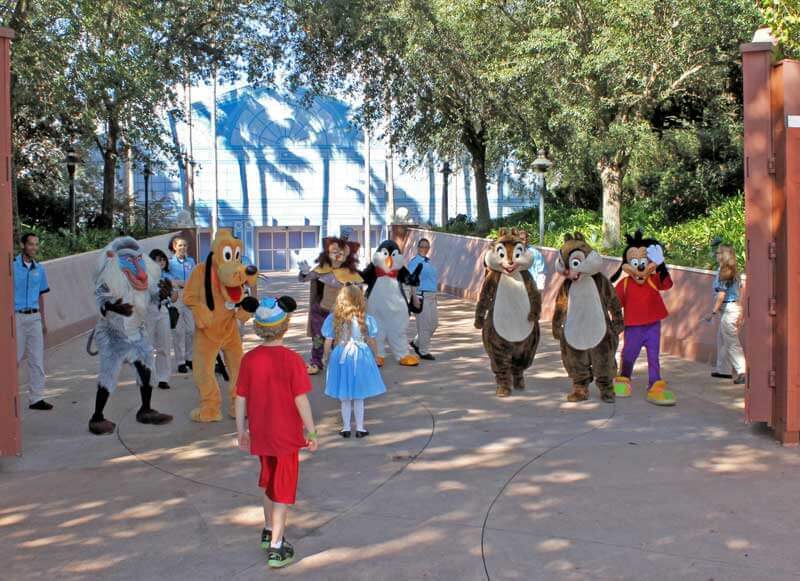 During a typical visit with a character, the kids would run over to visit once it was their turn. Sometimes the kids took their booklets and markers with them, while most of the time my wife would hand the booklets (with a blank 4x6 card facing up) and a marker either directly to the character or to a Disney cast member that was assisting the character. The characters liked to have all three booklets stacked so that they could easily sign all three. After signing, posed pictures were then taken. However, sometimes the posed pictures were taken first, and then the autographs were signed just before the visit ended. We saw some of the characters multiple times, so we did not obtain an autograph from the character with the later visits. Also, with an eight-day visit and many character greetings, the kids’ booklets became filled and we had to use both sides of some cards. Next time, I’ll take extra booklets just in case they run out of room again. The size of the photo album you select will depend on how many autographs were collected and how many pictures will be included. There are some Disney-themed albums that are available or you can buy a generic album and decorate it with Disney stickers. For each of my kids, I purchased an album with capacity for 200 4x6 pictures or cards. Next, I sat down with each child and sorted through their autographs to get them in the order they wanted. Then, we started placing them in the album. With the layout of the pages, it worked nicely to have one autograph with either one or three accompanying photos (as shown in the picture). If there were multiple autographs from a character, the kids usually picked the one they liked the best, but they sometimes included multiple autographs for a favorite. With the autographs in the album, the next step was to sit down at the computer and select the photos that the kids wanted to accompany each autograph. They selected one photo for many of the characters but would select multiple pictures for a favorite. After photos were selected to go with each character, I counted up the number of remaining spaces in their photo album and had them pick other pictures from the trip to fill out their book. For example, my 9-year-old had 50 openings left, so he picked six additional photos from each of the eight days of our visit to finish filling out his album. 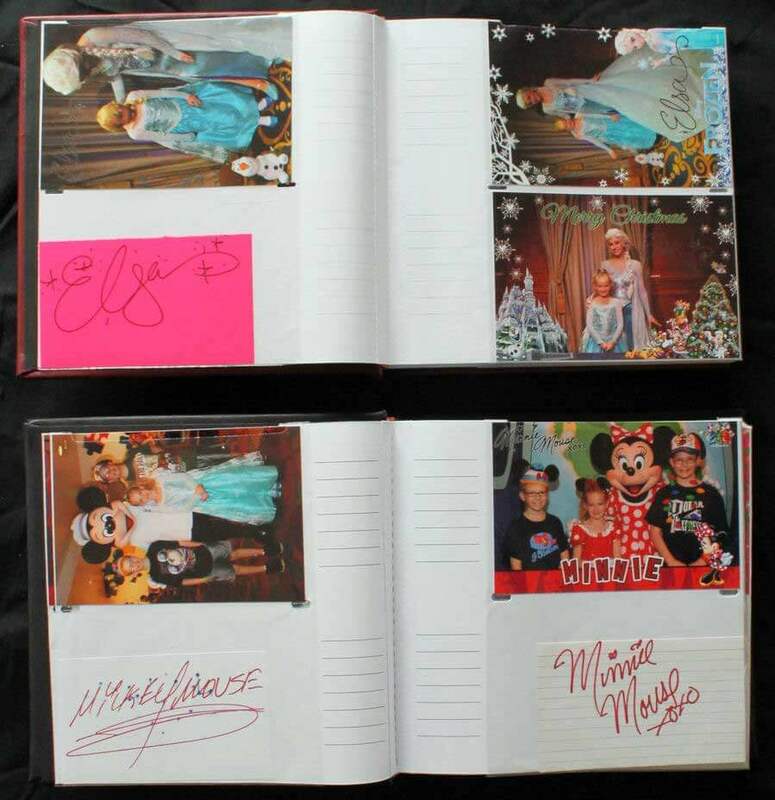 Creating a DIY Disney autograph and photo memory book like this took a lot more effort than just purchasing an autograph book and pen at the parks, but the kids now have a significantly more memorable keepsake of their visit. When they look over their autographs, they can see pictures of themselves with the character when they obtained the autograph. It also worked out great for the kids to share details of the trip with all of their relatives. Creating an album like this also gave us the flexibility to have more or less signatures, include just one or more photos per autograph, and organize the autographs however the kids wanted. The effort put into this keepsake captures the magic of our visit better than anything else we could have done or purchased. Vern and his wife are the parents of two boys and a girl that all love Disney’s animated movies and shorts. He lives in Ohio and is employed as a mechanical engineer, which helps to explain his excessive attention to detail, organization and planning. His oldest son enjoys watching the animated shorts from the Disney Treasures series, his youngest son has the middle name “Donald” and he likes telling people that he was named after Donald Duck, and his daughter loves the Disney Princesses, especially Rapunzel and recently Elsa. Have a guest post you would like to share with us? Review our guidelines.